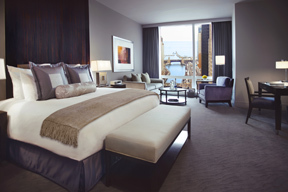 Some hotels know how to create a luxury experience before you even arrive; Trump International Hotel & Tower Chicago is definitely one of them. 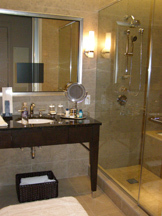 Pampering begins at the reservation level and continues throughout your stay. 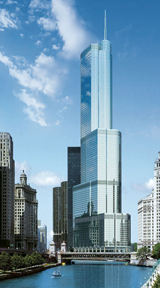 The hotel's stunning architecture combined with their restaurant, Sixteen, The Spa at Trump Chicago, unparalleled views, and proximity to shopping on The Magnificent Mile make it destined to become one of Chicago's premier landmarks. Chicago has a rich history of spectacular architecture that includes the Wrigley Building built in the 1920s, the Tribune Tower built in 1925, the John Hancock Center built in 1970, and the Sears Tower built in 1973; Trump International Hotel & Tower Chicago built in 2008, rightfully deserves inclusion into that select group with its sleek and soaring sexiness that rises into the sky resembling a shining glass wedding cake. The 339-room and suite hotel opened in January 2008 and has been wowing guests ever since with its elegant style and excellent delivery of service. Edward and I stayed at the Trump International Hotel & Tower Chicago in June 2009 and were impressed from the minute that we received our hotel confirmation with its Pre-Arrival Request a Service system where we could preorder special pillows for our room, as well as arrange for delivery of champagne, cakes, special amenities, and even have groceries delivered if we wanted. The hotel had thought of everything, all we needed to do was arrive. Although we had seen photographs of the hotel prior to our arrival, they did little to prepare us for the actual hotel. Imagine 92-stories of shining streamlined glass on the banks of the Chicago River; the hotel seems to soar endlessly above. 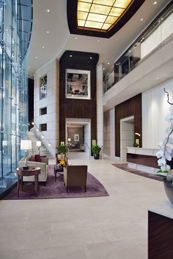 The interior of the hotel features contemporary elegance with marble floors, stylish furnishings, potted plants, and guest service is their first priority. 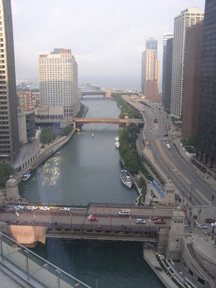 We stayed in a spacious Deluxe King City View Room in the Tower section of the hotel on the 24th floor, featuring a 10-foot floor-to-ceiling window framed with ivory sheers and slate window treatments that provided us with an expansive view of the city. A champagne velvet sofa bed and slate velvet armchair with matching ottoman flanked a round dark wood coffee table that held an assortment of magazines, and created an intimate seating area by the window. A smaller round table held an assortment of waters, a potted ponytail palm added an ambient touch of warmth, and a well-stocked magazine rack placed next to the chair provided an abundance of reading material. The residential feel continued with interesting framed photographs on the walls, and an armchair and well-accessorized large desk held a desk blotter, glass paperweight, and a framed photograph of Chicago. Inside the desk, attention to detail continued with thoughtful amenities of tape, post-it pads, paperclips, a highlighter, a bookmark, and even a jogging map. A well-equipped kitchenette featured granite counters and a 2-burner Miele cooktop, Sub-Zero refrigerator, GE Profile Microwave, Cuisinart Toaster, Miele dishwasher, electric teakettle, Nespresso machine, Cuisinart cookware, a selection of Spiegelau glassware including Martini glasses, highball glasses, rocks glasses, wine glasses, champagne glasses, and a pitcher, Bernaudaud china from France, cutlery, and a nice selection of kitchen gadgets. Although we were not planning on doing any cooking, it was nice that it was so well stocked. The large limestone bath featured a glass enclosed walk-in shower and deep-soaking tub, luxe robes, pedestal lighted vanity mirror, hairdryer, scale, amenities by The Spa at Trump, and a definite highlight was their in-mirror TV portal. The king bed featured a floor-to-ceiling wood and leather headboard, and the bed was invitingly dressed with a pristine ivory duvet, taupe bedskirt, a selection of six bed pillows, as well as decorative pillows in taupe, slate, and champagne, and the three pillows that we had preordered before our arrival. The hotel has an interesting Pillow Menu consisting of five types of pillows in varying degrees of density, as well as five aromatic pillows, and we felt rather like Goldilocks making our selection that included the Airway pillow (reduces snoring while also minimizing neck and shoulder soreness), the Synthetic pillow (a "down alternative" and completely non-allergenic), and the Purify pillow (to cleanse the body and spirit, with juniper, grapefruit, sandalwood, artemesia, and menthe to foster mental clarity and enlightenment, and to enhance awareness and stimulate peaceful dreams); if we could not sleep soundly with that selection of pillows, it would certainly not be the fault of the hotel. There was an upholstered bench at the foot of the bed, and square wood nightstands on either side of the bed that held a Bose system and large geometric lamps with wide rectangular ivory shades. Opposite the bed, there was a large console that held a silver tray with an ice bucket and cocktail shaker, a framed photograph of British Artist Anish Kapoor's Cloud Gate sculpture in Millennium Park, a lamp with a rectangular ivory shade, a 42-inch LG LCD flat-screen HDTV, and discretely hidden safe. There were two closets that held an iron and ironing board, slippers, and umbrella, and are large enough to hold guests' purchases after shopping the nearby Magnificent Mile that is lined with a wide range of designer shops. 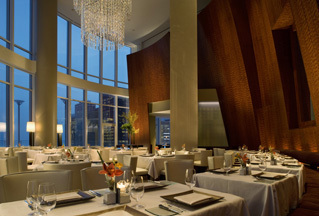 The hotel has excellent amenities that include two restaurants Rebar on the Mezzanine level, and Sixteen on the 16th floor, The Spa at Trump Chicago and Health Club, and a large, windowed Business Center. 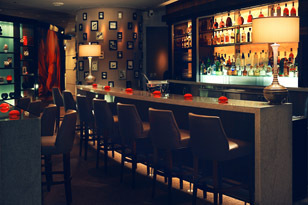 The view and the attractive ambience at Rebar, combined with a creative cocktail menu, well-stocked bar, and innovative sushi menu, make it a perfect place to relax with friends over cocktails. We began our evening in Rebar enjoying one of their signature cocktails, the Sgroppino, a luscious libation made with Mionetto Prosecco, Trump Vodka, Lemon Sorbet, and Monin Lavender Syrup and asked Barman Steve Sedowski if he would share the recipe, which he graciously provides to share a taste of Rebar. Method: Pour champagne into glass. In a cocktail shaker, add the Trump Vodka, sorbet, lavender syrup, and ice. Shake until can is frosty, strain into the champagne glass. Garnish with an edible orchid. We also had a wonderful gastronomic evening in their fine dining restaurant, Sixteen, where Executive Chef Frank Brunacci is clearly in his element. The dining room features a dramatic 35-foot ceiling and a wide wall of windows provides a commanding view of the Wrigley Building and the Tribune Tower that is a perfect complement to Executive Chef Frank Brunacci's innovative cuisine that tempts the palate with his creative pairings and presentations. A few of the many highlights of our dinner began with the Amuse Bouche of sunchoke soup with duck sausage served in an Asian spoon and garnished with herbs, and continued with Pacific rock lobster with crème fraiche, aioli, celery, and parsley, wrapped in a wonton tuille, accompanied by Meyer lemon sauce, baby greens, and avocado mousse topped with slivered breakfast radish; and braised pork belly, pork taco with plantains and salt, pineapple, and pea shoots. For guests that want to enjoy a cocktail with a spectacular view, it does not get any better than the Bar at Sixteen, which shares the same view as the restaurant, Sixteen. During the summer months, the terrace is open making it the perfect place to watch the fireworks on Wednesday and Saturday nights. Although the guestrooms have complimentary wireless Internet access, there is also a well-equipped Business Center with large desks complete with computers, printers, and copiers for when you require additional workspace, which we used throughout our stay. The Spa at Trump Chicago is an attractive 23,000 square foot space located on the 14th floor of the hotel that combines Spa services, a well-equipped state-of-the-art Health Club where guests may exercise with a view, and a 75-foot heated swimming pool where we felt like we were combining exercise with sightseeing as we swam laps on our sides and enjoyed the view. The Spa also offers Yamuna body rolling, Yoga, Spin, Pilates, Fit Circuit, Strength and Conditioning, Essential Flexibility, Water Workout, and Swim Technique classes. 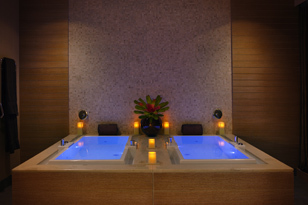 The Spa at Trump Chicago offers a wide range of pampering Spa treatments, which I indulged in during my stay. Trump International Hotel & Tower Chicago is more than just a pretty face; the hotel has the art of taking care of their guests down to a science from special programs for children to special services for small pampered pooches. 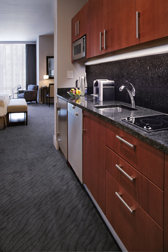 Located 40 minutes from Chicago O'Hare Airport, the hotel is perfect for business as well as leisure travelers. Read about Trump International Hotel & Tower Chicago in the Destinations, Restaurants and Spas sections, and in Chefs' Recipes where Executive Chef Frank Brunacci shares his signature recipe for Duck Percik.